Bowing to pressure, U.S. President Donald Trump orders American flags at government buildings lowered to half-staff for Sen. John McCain until his burial on Sunday — just hours after the White House flag had been returned to full-staff, drawing complaints from the political right and left. 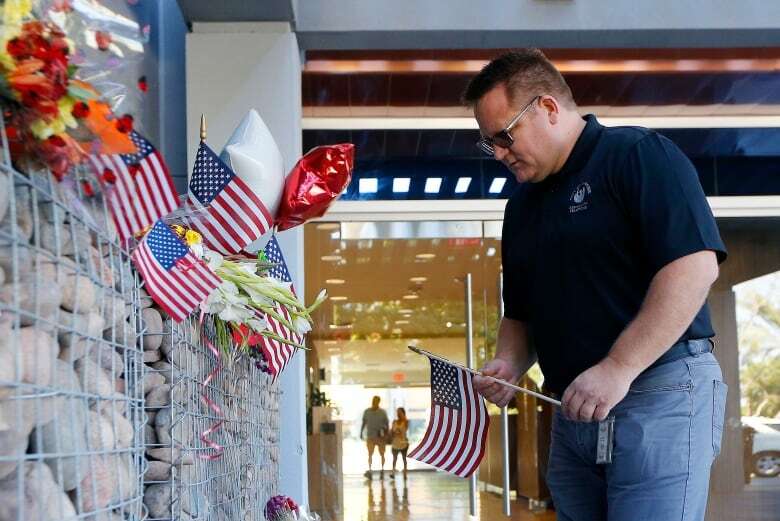 Bowing to pressure, U.S. President Donald Trump on Monday ordered American flags at government buildings lowered to half-staff for Sen. John McCain until his burial on Sunday. Trump's proclamation came just hours after the White House flag had been returned to full-staff, drawing complaints from across the political spectrum. Trump, who had traded bitter criticism with McCain since before the 2016 election, declared his order "a mark of respect." At the same time, he said he'd accede to the family's request that he stay away from McCain's funeral services. "Despite our differences on policy and politics, I respect Senator John McCain's service to our country and, in his honour, have signed a proclamation to fly the flag of the United States at half-staff until the day of his interment," Trump said in a statement. Later, at an evening dinner honouring evangelical leaders, Trump said "our hearts and prayers" are going to the family "and we very much appreciate everything that Senator McCain has done for our country." Earlier in the day, a stone-faced Trump sat mute as reporters at several photo sessions invited him to comment on McCain. As he was peppered with questions about McCain's legacy, the usually talkative president made no response. His official statement came two days after McCain died at 81 from brain cancer — and after objections at Trump's silence from lawmakers and others, including the American Legion, which demanded that he do more to honour the Vietnam War hero and six-term senator. The president reportedly nixed an early tribute drafted by his communications team, choosing instead to post a terse tweet offering condolences to the McCain family, but failing to directly memorialize the six-term senator and Vietnam War hero with whom he feuded for years. "The protocol historically has been that presidents acknowledge with respect the contributions of people like John McCain, who cast such a large shadow on our country's recent history," presidential historian Mike Purdy told the CBC's Matt Kwong. Even as flags remained at half-staff Monday at the Capitol, the Washington Memorial and elsewhere, the White House flag was raised. That seemed to be the breaking point for a key Trump constituency — veterans. "On the behalf of The American Legion's two million wartime veterans, I strongly urge you to make an appropriate presidential proclamation noting Senator McCain's death and legacy of service to our nation, and that our nation's flag be half-staffed through his interment," said a statement to Trump from Denise Rohan, the organization's national commander. Some protested outside the White House around midday Monday to voice their distaste for the full-staff flag. "It's disrespectful — and it's small," said Patricia Harrison, who hoisted a protest sign that demanded the president "show respect" for Trump's vocal opponent and "lower the flag" for McCain. "All these other flags have been lowered. You can see them," said another protester, Melissa Oppenheimer, gesturing toward the Freedman's Bank, the Treasury Department and the Veterans Affairs building. "It's very peculiar. It seems very personal against Sen. McCain." By day's end, Trump had reversed course, with no immediate explanation from the White House. "It sounds like in the end, he probably decided it was a political loser to continue to hold out on this," William Howell, an expert on presidential powers who lectures at the University of Chicago, told CBC News. "I don't know who got into his ear that changed his mind, but the [reports] that his very closest advisers — his chief of staff and his press secretary — both recommended to him earlier that he recognize John McCain as a hero, suggests that the pressure was as close as it could be." Yet evidence of Trump's feud with McCain remained. The senator's family had requested that Trump stay away from the funeral services, which will culminate with McCain's burial at the U.S. Naval Academy in Annapolis, Md. Trump said Vice-President Mike Pence will address a ceremony at the U.S. Capitol on Friday. Others in the administration — Chief of Staff John Kelly, Defence Secretary James Mattis and National Security Adviser John Bolton — will represent the administration. U.S. Flag Code states that flags be lowered "on the day of death and the following day for a Member of Congress." But lowering the White House flag to half-staff for several days is customary for marking the death of a revered legislator, no less a giant of the Senate. 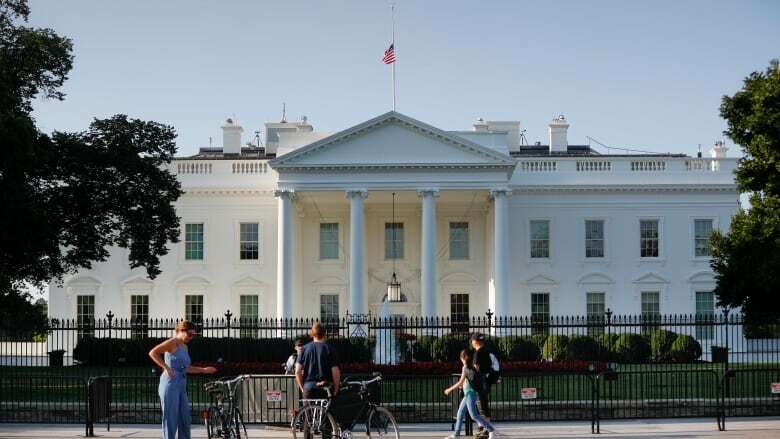 President Obama, for example, ordered the White House flag to be flown at half-staff for five days following the death in 2009 of senator Teddy Kennedy. McCain was a frequent critic of Trump on everything from his leadership style to his Russia policy. Trump questioned the decorated Navy pilot's Vietnam heroism and chafed at McCain's vote to kill the president's "Obamacare" repeal. A final letter from McCain expressed his deep gratitude and love of country, and offered words of wisdom to his fellow Americans. In the statement, McCain reflected on the privilege of serving his country and said he tried to do so honourably. He also touched on today's politics. "Do not despair of our present difficulties but believe always in the promise and greatness of America, because nothing is inevitable here," McCain wrote. "Americans never quit. We never surrender. We never hide from history. We make history." McCain rejected the white-nationalist sentiment that has fuelled Trump's rise, saying the U.S. is "a nation of ideals, not blood and soil." He also warned about the U.S. succumbing to "tribal rivalries" and hyper-partisanship. The senator will lie in state for public viewings at the Arizona State Capitol Wednesday and at the U.S. Capitol in Washington, D.C. Friday, before his burial on Sunday at the U.S. Naval Academy. 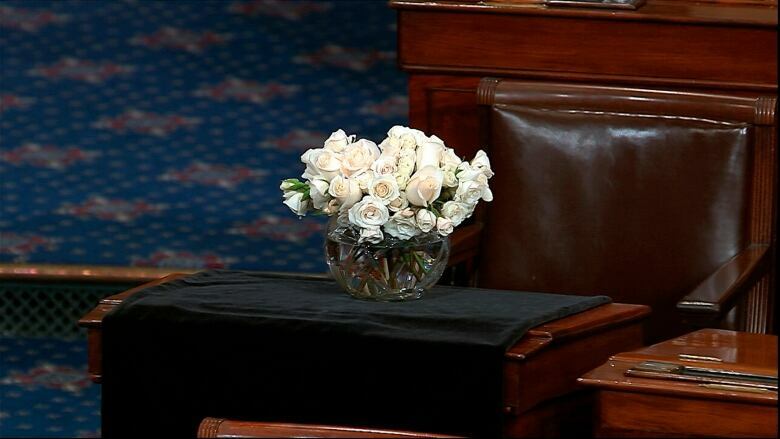 Memorial services for McCain will include tributes from his children and fellow politicians. Davis said U.S. Sen. Jeff Flake, former U.S. Sen. John Kyl and Arizona Gov. Doug Ducey will be among those who speak at services in Phoenix. Former vice-president Joe Biden will pay tribute at a Thursday service at North Phoenix Baptist Church. The service also will include choir performances and a bagpiper. Former presidents George W. Bush and Barack Obama will speak at a Saturday memorial service at Washington National Cathedral. The program also includes a tribute from McCain's daughter Meghan, plus a performance of "Danny Boy" by opera star Renee Fleming. With files from the CBC's Matt Kwong.